FAIL. The UAH data is NOT surface data. FAIL. 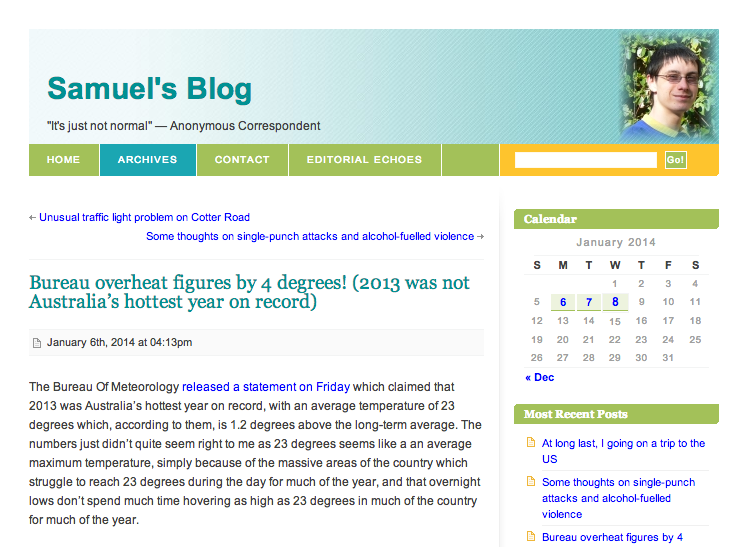 The UAH data shows 2010 was the hottest year on record for Australia in the Lower Troposhpere. FAIL. The long term trend in both datasets is upwards. If the satellites showed that the last Australian summer or this year was unusually hot, why would Lewis, Karoly, climate comm, or complicit media consistently leave this important sat data out of their reporting? If the sats showed any unusual heat trend, surely they’d refer to them. Or maybe they don’t like them, like you, because they don’t fit the warming narrative? Or maybe you guys never knew satellite data existed? You might want to check out UHI effects on surface data. And the BOM’s adjusted ground temp recording techniques. Here’s some more UAH satellite stuff for you to strike out on. Hey dipsitck, you didn’t address any of my points. Are you dumb or what? All you’ve done here is repeat youself. As to your repeated theory of “if CO2 caused the warming, it would turn up in these satellite records before we saw it in the surface charts”, can you explain to us what happens when ENSO enters a El-Nino cycle and the surface will warm before the atmosphere. I’ll enjoy your inept response. You’ve got absolutely no idea what you’re talking about do you. Sure I do and my prediction confirmed. When the ENSO enters an el-Nino cycle the oceans release heat into the atmosphere. this will of course warm the surface, before it can warm the rest of the troposphere. Your reply (or lack thereof) confirms your lack of knowledge in this area. When, could, should, will, maybe…..
Pseudo-science Wilson. Just like those failed models with flawed assumptions. Not to mention the utter insanity basing trillion dollar draconian climate policy, schemes and scams on garbage spat out from unverifiable predictive models which do not accord with observed reality. Junk science run by climate morons. You again fail to address my comments and instead attempt misdirection. Typical brainless climate denialst twit.